Over the past year or so now, for some reason i kept on making more and more category links on my blog, i don’t know why i made them because they were pretty pointless. So today i decided to delete all of my categories except for just my blog category. I then went through all of my old posts and switched them into the same category so now i have a nice organised and less spread out list of blog entries. Now just because i deleted all of my categories does not mean i won’t be making more of them, in fact i already have an idea on one more that i want to make. Over the next few days i am going to be making more categorised posts alongside my normal posts. Most likely i will switch them out every other day. I want to start making some posts that will help people out. Some of my most popular posts here on my blog are of that type, so i think if i can make some more content like that it will help out. I often become stuck when doing certain things and turn to Google but a lot of the time other people have the same problem as me so it takes a long time to find a solution and sometime one cannot even be found. Usually when i find what i am looking for i just forget about it after implementing it, i think that it is a waste doing that. So from now on if i find something interesting that i found difficult i am going to share it. It’s like smemon say about taking as much pictures as you can, the more you take the better it will be in future for the web as more content is always a good thing, so my contribution to this will be by making more helpful posts. I do not take many pictures that would benefit too many people, usually the pictures i take are of family and friends so i they usually do not find there way to the likes of flickr where i would share them with a creative commons license, instead i put them on my Facebook. So as an aim for 2011 i want to make more useful posts and i think this will be achievable. Next week i will be going back to college for my last ever semester. I think this is as far as i am going to go with my education, i have spent the last 17 years in an education environment and it is beginning to get to me. If i manage to pass all of my exams that i have already sat and the final ones i will be sitting later this semester then i will get myself my second degree. Having two degrees is enough for me. I am really looking forward to the end of this semester; i want to go away on a few trips which will most likely include some parts of Ireland and going back over to Edinburgh. The timetable for my last semester has just been put up lately and it is looking really good, however the college is known for changing the timetable about 50 times in a week! This semester has a lot less class hours at the moment, i expect this is due to the fact that we all have a dissertation to get done. I reckon that the free class slots will be filled with dissertation so we have scheduled time during the day to get some work done on them. Yesterday i completed my portfolio website; i have wanted to make this site for a long time and wanted to make sure i got it right. The way i look at this site is that i want to get business from it, so in order for that to happen i have to make it as appealing and professional looking as i can. A few years ago i managed to register my own name (Sean Lucas) as a domain name, i was never too sure as to what i would put on it, i just got the opportunity, so i registered it. Sometime last year i finally decided that it would best suit to host my portfolio, it’s a personal domain name so i thought it would be best to fill it with what i do, which is websites. It took me a long time to settle on this design, as of lately i have become very fond of simplistic sites, this is shown here with the design i created on my blog and also on the design i have made for my portfolio. While i was developing this site of the past few months on and off i was also working on getting good SEO onto the domain for the portfolio, i put up a little splash page with my name and email just so i could add in some SEO code, this proved very beneficial because i managed to get my portfolio domain up to number one spot i Google results (at least here in Ireland). Once i finished coding my website, i decided to put it onto the wordpress platform, i do this will almost all my websites and continued the tradition on with this one too. 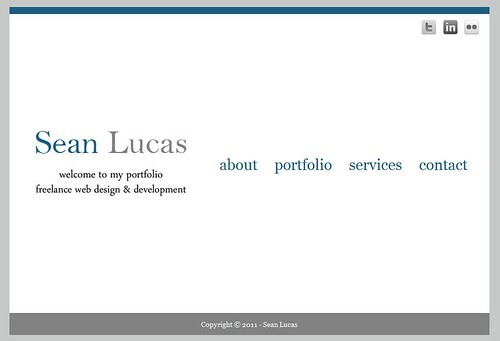 The main reasons why i wanted to use wordpress for my portfolio were the plugins that are available. On my portfolio i installed a cache plugin to speed up the site and i also installed a great contact form plugin, i also put on a few extra ones which help out with SEO. My portfolio has a lot of information on it that relates to me, i have an about page which will tell visitors all about who i am. The next page i have is my actual portfolio page, here you can see some of the websites i have created, i have some others but only decided to add in a few. The third page is services; here i said what i can do for you if you are looking to get a website. The last page is pretty much self-explanatory, it is the contact page, here you can send me an email using a form describing what you would like. I also added in a few social network links, i included my Twitter, LinkedIn and Flickr accounts. I am really happy with how the site has turned out and i don’t expect to make too many changes to it for the next while, unless i am updating my portfolio page. This is the first website that i have launched in the past few months and also this year! This site is extremely simple looking and it is, it consists of just one page, which has to be the smallest website i have ever built! This site is for a friend of mine who does a YouTube series; he just wanted a simple site that links all of his other sites together such as twitter, MySpace, YouTube and iTunes. I finished this design sometime last year, but didn’t get around to building the site. Before i could launch another one of my sites (which i will talk about tomorrow) today i had to get this site from just a Photoshop design to a working website. To start of i just created the html page and the css page. I could have left it at that and uploaded it onto the internet so it was live, but i wanted to get the best SEO that i can get onto this site so i ported it over to wordpress next. I have ported so many sites to wordpress now; it has become second nature to me. I find wordpress a reliable platform; it allows me to add things to the site anywhere, instead of just at home because if it was a plain HTML site i would need my FTP program. I can also install a cache onto the site, this is important, especially on this site, i have this on my hosting package and since Brian has a large amount of subscribers i do not want any of my other sites to crash if his site gets any amount of traffic, so this cache allows me to dish out a slimmed down version of the site to visitors and it also loads lightning fast!. I also set up a custom email address which uses Google apps, it is great to have a personalised email address, and it looks good if you are telling someone it! 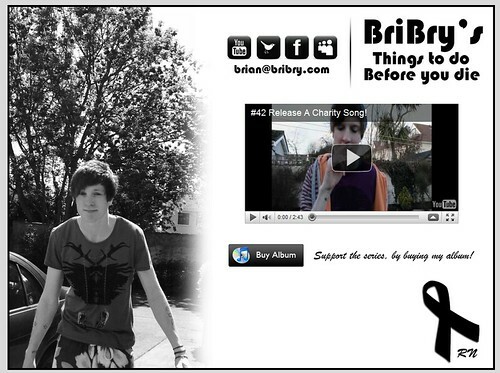 The whole reason for this YouTube series is a tribute to Brian’s (BriBry) best friend who died last year of cancer, so if you want to have a look at what he is doing check out the website!